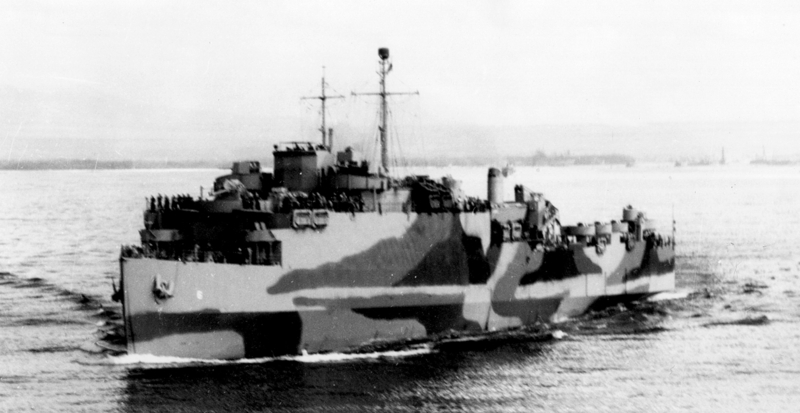 USS Lindenwald (LSD-6) in a view from port bow on an unidentified date, but probably early June 1944, wearing camouflage 31/9L near San Francisco. The vertical colors should be dull black, navy green, ocean green, haze gray and light gray. This photo was marked as received on June 25, 1944, but was probably taken just after Lindenwald was refitted in San Francisco. Photo source: NARA BS 69756.